A scholarship can have a resonating impact on not only a student’s college career but on the rest of their life. This is true for Matthew Yohman, a Licking County Foundation scholarship recipient and recent graduate of The Ohio State University. Matt is a Licking County native and a 2011 graduate of Granville Christian Academy. Due to the increasingly high cost of tuition, Matt chose to attend a community college for his first two years of school. “My goal was to go to Ohio State, but it’s a lot more expensive. So I started with a small community college and was able to do two years,” said Matt. After getting his Associate’s Degree from Columbus State, Matt saved enough money to attend his dream school but only had enough money for a year of tuition. “The plan was to maybe go to school for a year, take some time off, make some money again and then try to get back into the school routine. Which I didn’t really like the idea of because taking time off makes it hard to get back into the school routine,” Matt said. During his sophomore year, Matt decided to apply for scholarships through the Licking County Foundation. Matt was surprised to be awarded the Raymond H. and Beryl Dean Penick Memorial Scholarship. Matt continued to receive the Penick Scholarship for the rest of his college career. This greatly lightened the financial burden on Matt, who was able to conserve most of the money that he had worked so hard to save for tuition. Matt, a shining example of a young philanthropist, was also able to spend the past three summers volunteering at a camp for inner-city youth in Cincinnati. 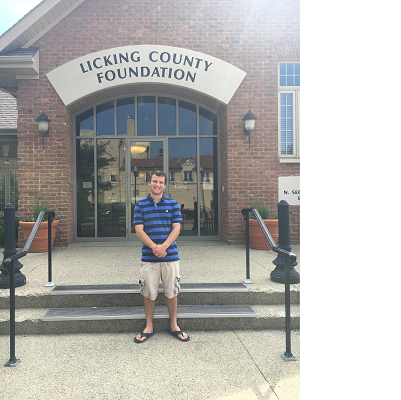 “Every year the Licking County Foundation blessed me with a scholarship and I was able to spend my summer volunteering instead of working a job. There is no way I would have been able to do that without the scholarship because I would have to be working to earn money,” Matt said of his time volunteering. Matt has a sister who is also a Licking County Foundation scholarship recipient, currently in nursing school, and a brother who will be applying for scholarships through the Foundation before he attends college. Matt is interested in becoming a member of the Foundation’s Scholarship Review Committee after his siblings are finished with school. “When there is an organization like this one that really is invaluable in getting a college degree, it’s nice to be able to give back so that other people can experience that too and experience it in perhaps an even better and bigger way,” said Matt.